Here is a small section from an article that appeared in the Australian Coin and Banknote Magazine for March 2018. If you are interested in this post the magazines for February and March contain articles on the provincial coins of Charles I. A follow up article on the siege coinages from that period is also to be published in CAB Magazine. “York Mint The Cylinder Press. After Charles I was forced to leave London in early 1642 plans were made to set up a mint at York and a formal warrant to do so was sent in July. Coining began in January 1643. The resulting coins are among the finest in appearance of the royalist issues. This is due to the method of manufacture. Although there is no direct record a detailed study of the coins has showed beyond doubt that the coins were machine made using a cylinder press. It is the only time it has been used in Britain for production of silver coins. This method used dies cut on cylinders which were geared together in a press like an old fashioned clothes wringer. The machines could use water or animals to power them, but at York it is most likely that mint workers powered each press. The metal was rolled to the correct thickness, annealed, blanched to give it a silvery appearance and cut into strips that were fed into the press. The coins were then punched from the strip. The sharp edges from the mechanical punch were removed by rolling in sand. This method had been used extensively in Spain and Austria for several decades. It results in coins with specific die pairings each of which has a particular alignment. The flans are slightly curved and an error in minting the coin can leave the flat edge of the strip on the coin. The most remarkable proof of the method of manufacture is where the punch was off centre so the edge of the next coin on the strip just showed on the issued coin. Some remarkable conclusions have been reached following detailed examination of surviving coins. For example the shillings were made from two sets of cylinder dies, each with five die pairs, and a circumference of 148 mm. The silver content of the metal was about the required 92.5% and there are traces of gold indicating gilt plate was melted down to provide the bullion. The delay between issue of the warrant and commencement of manufacture was probably due to the need to assemble the equipment and skilled workers, and to collect the bullion. The method of production and the quality of die making indicates the influence of Nicholas Briot who had experience in using the cylinder press. It is thought that coining ceased at York before it was besieged in April 1644. The coin illustrated shows a number of features that are indicative of the way it was made using a cylinder press. See below for details. The large crack in front of the king’s face is from insufficient annealing of the metal strip fed into the cylinder press. The pressures of rolling the blank metal strip over the curved die opened up the crack at a weak spot. The flan is slightly dished. The edge is raised on one side from the mechanical punch used to cut each coin from the coined strip of silver. Even though the coin is a little more than full weight and thus not clipped there is a straight section on the edge. This is most likely due to the edge of the blank metal strip remaining after its slightly off-centre presentation to the roller dies. 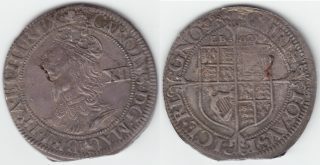 Charles I, York mint, Shilling, 6.17g., m.m. lion. Obv: Bust left in scalloped lace collar with lank flowing hair, XII behind. Rev: Oval garnished shield, EBOR above. Although little wear is visible this coin shows a crack due to manufacture in the cylinder press and insufficient annealing of the metal. There is a straight spot on the edge due to the silver strip originally fed through the cylinder press not being centred. Previous Entries New Australian $50 Note Design Revealed by Reserve Bank Next Entries The VNJ now available online.